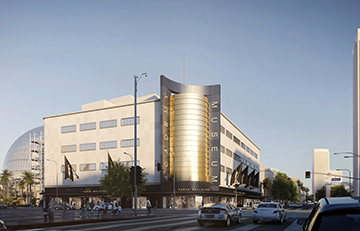 Western Specialty Contractors branches in Los Angeles, CA and Seattle, WA are teaming up on a project to restore the historic Saban Building (formerly May Company department store) in Los Angeles, CA—the future home of the Academy Museum of Motion Pictures. Western crews are working alongside renowned historic preservation consultant John Fidler, New York Pritzker-Prize winning architect Renzo Piano with Renzo Piano Building Workshop and Gensler, general contractor Matt Construction of Los Angeles, CA, and owner’s representative Paratus Group of New York, NY. Described by the Los Angeles Conservancy as the grandest example of Streamline Moderne architecture in Los Angeles, the historic May Company store, now called the Saban Building after donors Cheryl and Haim Saban, is undergoing an extensive expansion and renovation to accommodate the Academy of Motion Picture Arts and Sciences’ new museum. Three glass bridges will connect the existing building to a new eye-catching, 130-foot tall spherical structure made of glass and concrete that will overlook the Hollywood Hills. Scheduled to open in 2019, the 290,000-square-foot, six-story museum will celebrate and explore the history and art of films and filmmaking through exhibition galleries, two state-of-the-art theaters including the 1,000-seat David Geffen Theater, an education studio, a restaurant and cafe, event spaces, and a store. Western crews are installing new limestone and granite on a portion of the existing building’s facade, making limestone Dutchman repairs, waterproofing and repairing window frames, patching and cleaning stone, installing granite Dutchman repairs and waterproofing portions of the facade. Constructed in 1939, the Saban Building is located on Wilshire and Fairfax next to the Los Angeles County Museum of Art campus, and is listed as a Los Angeles Historic-Cultural Monument. The iconic building was once the finest department store on the Miracle Mile and is most recognized by its predominant gold-tiled cylinder at the corner of Fairfax Avenue. For more information about the museum, visit www.academymuseum.org.